Ever saw Little Nemo: Adventures in Slumberland? Its an anime that was based on a comic strip by Winsor McCay which ran from 1905 to 1914. Well the anime was released in 1989 in Japan and 1992 in America. It was also made with Japanese and American cooperation. It’s about a little boy who has many nightmares named Nemo who was summoned to sumberland in his sleep to be the princess’ friend and to be future prince. That’s when adventures ensue. Nemo listens to the wrong advice and releases the nightmare king who he has to capture and save the king that had been gobled up by it. By saving the king and defeating the nightmare king he deals with his own nightmares. It’s a nice cartoon to watch, but it is a kind of strange which may have led to its cult status. A little bit of the comic. 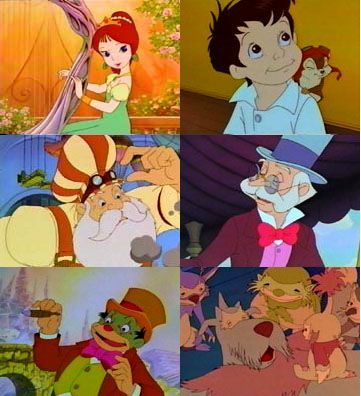 Some of the Characters from Little Nemo.